Stuffed peppers, although considered to be a vegetarian meal can be served as an accompaniment to main meals as well as a filling lunch or family dinner. Peppers are now easily purchased in most supermarkets and in a variety of colours. Bought singly or in packs, look out for special offer packs of odd shaped peppers. As the peppers have to be cooked standing in a baking tin then carefully slice pieces from the bottom of the peppers until there is a level base. The fillings inside a pepper are completely up to you and are determined by your family’s tastes. Precook any foods that would take too long to cook inside the stuffed shell of the pepper. Rice, onion and meats (if cooking for a meat eater) should be precooked otherwise they could be either undercooked or still hard and crunchy when the meal is served. 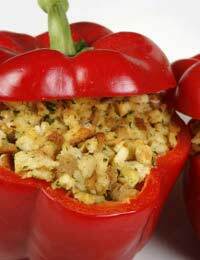 If the filling is cooked in a gravy or sauce do not put too much of this into the pepper when stuffing it. It is likely to overspill and burn during the cooking time in the oven. Instead serve the sauce or gravy as an accompaniment to the meal. Slice the top from the pepper, this can be kept and used as a lid to the roasted pepper. If not using it as a lid cut away any pepper and dice this ready to go into the filling rather than waste it. Carefully remove the seeds from inside the pepper and wipe clean. Make sure that the pepper will stand unaided as it looks more attractive on the plate when served. Cook in the oven at 200 degrees C or gas mark 6 on a middle shelf. Cooking time will depend on the filling used but the pepper itself should be soft without falling apart. Place scrunched up pieces of cooking foil between peppers whilst cooking to save them falling over and losing the filling. A little water in the bottom of the roasting tin will help steam the peppers so they do not go hard. Place the rice in a pan with boiling water and cook until tender, Drain well when cooked. Heat the oil and add the onion garlic and carrot. Cook gently until soft but not brown. Add peas and sweet corn and cook for a further three minutes. Add the curry powder and cook for two minutes until the mix is covered in the curry powder.Add the water and gravy thickener and cook until thickened. Fill the peppers and bake as above for about thirty minutes or until the peppers are tender. Note: Chopped ham or chicken could be added if you are cooking for meat eaters.